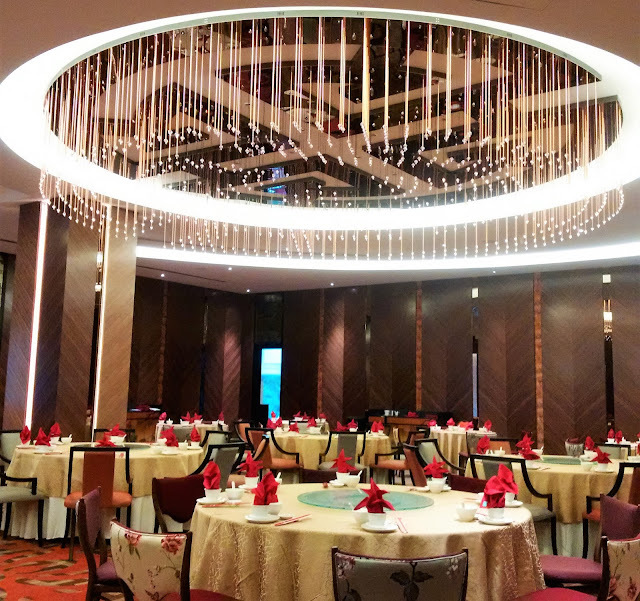 Delicious pork-free dim sum and Chinese specialities beckon residents living in the southern Klang Valley at Le Mei, the new Chinese restaurant at Le Meridien Putrajaya. Clad in muted shades of cream, bronze and matte gold with the occasional bursts of red, Le Mei flaunts plush underfoot carpet and tasteful Chinese interior decor elements that make diners feel welcomed and put them immediately at ease. Although just two months old, Le Mei has become the hot lunch spot for the corporate and government sectors and individuals in the vicinity. Chef Michael Wong and his team have their hands full serving up a variety of piping hot Signature Dim Sum and Chinese dishes to please them. We were treated to an exclusive sampling of them recently, starting with a trio of Steamed Dim Sum (RM62): Black Truffle Shanghai Mini Dumplings, Steamed Scallop with Baby Abalone Dumplings and Chicken & Shrimp Dumplings. The Shanghai xiao long bao dumplings (top left) was surprisingly on point - its sweet meaty broth similar to the real deal. Granted the skin was a tad thick compared to more famous ones in town but that would be nitpicking. Happily, the springy succulence of both the mushroom and minced chicken siew mai and scallop dumplings were also on par. Out of the three Deep-Fried Signature Dim Sum (RM55), the Deep-fried Chicken Floss with Tuna & Shrimp Dumplings gained the most nods from us. We relished the filling's nice savouriness within the crunchy skin. Heavier flavours emerged from the Crispy Dried Cod Fillet with Fresh Prawns which should appeal to most local palates. We weren't so big on the Baked Bun with Barbecued Chicken though - our tastebuds rebelled against the rich and sweet, buttery crust as well as the sweetish filling. Have a penchant for soup? 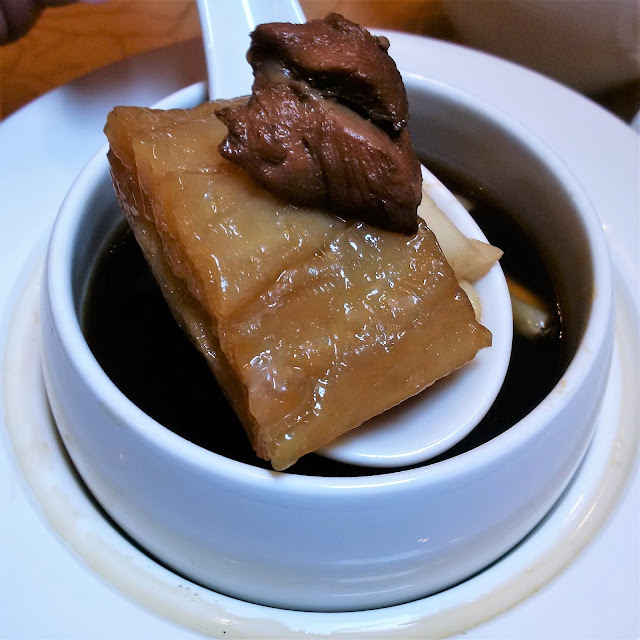 Try the nutritious Double-Boiled Chicken Soup with Black Garlic Bulb (RM60). Dark and potent, the brew was a tad too rustic for my liking due to the black garlic used along with fish maw, shimeiji and chicken. Wispy, billowy trails of dry ice heralded the arrival of Crispy Prawns Coated with Lemon Dressing, Tropical Fruit Salsa and Tobiko Caviar (RM68). Granted, it was a deftly prepared offering with the prawns lightly sheathed in crisp batter and creamy albeit stoic coating. Dotted with tiny dices of dragonfruit and strawberry, and tobiko, the crustacean dish lacked pizzazz. We reckon an unexpected burst of chilli heat or tartness would have jazz things up for the better. At first sight, the Steamed Soon Hock with Pickled Chilli and Soya Crumbs (RM45) held much promise but alas, I found my portion overcooked. While the fish still had its natural sweetness, the flesh was regrettably tough to stomach. Steaming fish demands close attention to timing so hopefully, this could be put down to the occasional lapse in judgement. 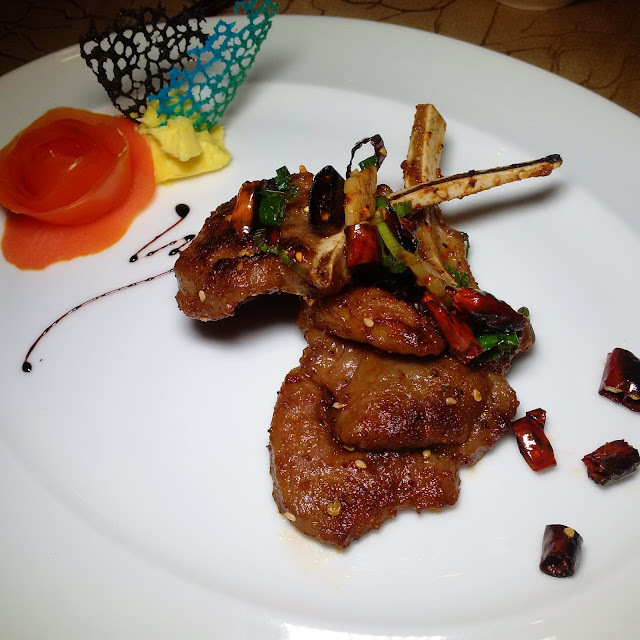 Thankfully, our faith in Le Mei was restored once we savoured the Wok-Fried Marinated Lamb Chops with Dried Chillies and Garlic Chips (RM85). Redolent with aromatic spices including the tongue-numbing Sichuanese peppercorns as well as sesame seeds, the delectable lamb pieces spurred us to pick the bones clean. 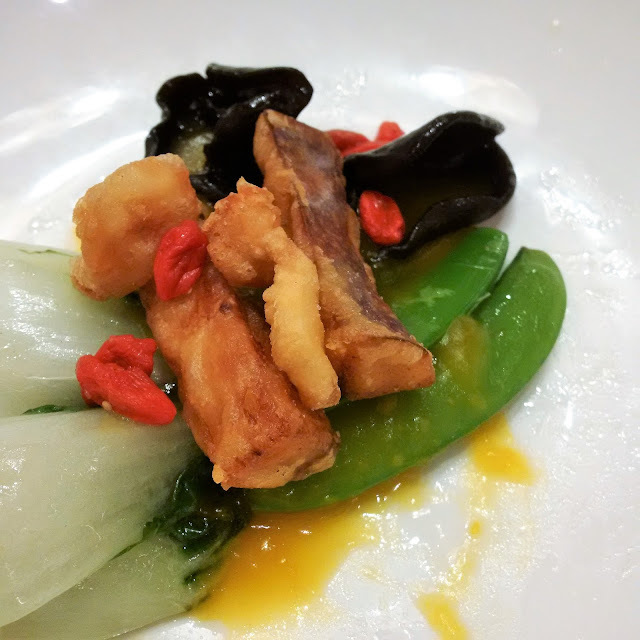 Personally, I'd pick the Deep-fried & Stir-fried Mixed Vegetables (RM64) as the session's stellar performer. Defyingly simple, the various greens (baby milk cabbage, eggplant and snow peas) and fungus (shimeiji & baby black fungus) melded so cohesively, we sung high praises of the dish's delicate textures and flavours. Since our tummy space was reaching maximum capacity, the Fried Rice with Crabmeat, Crispy Sun-Dried Scallops, Egg White and Sweet Bean (RM28) was dutifully tried and tested. It tasted acceptable although its presence failed to elicit much excitement. Perhaps we were too distracted by the dessert of Salted Egg Ice Cream with Red Bean Paste (RM6)? It was my first time sampling such an inventive flavour - the current trend has seen salted egg yolk infused into everything, from croissant to cakes nowadays. Taste-wise, the ice cream wasn't too weird as the eggy, savoury accent came out subtler than I had anticipated. A memorable way to wrap up our maiden visit to Le Mei. Méridien Putrajaya, Lebuh IRC, IOI Resort City, Putrajaya. Like the spaciousness of the place, a very comfortable dining area indeed.